(CNN) - Democratic presidential nominee Barack Obama appears to be gaining ground in some of the crucial battleground states that could decide the presidential election, according to a CNN/Time Magazine/Opinion Research Corp. poll released Wednesday. In Colorado, 51 percent of likely voters questioned in the survey back Obama, with 47 percent supporting his GOP rival, John McCain. And Obama's edge over McCain in Colorado is six points when looking at a larger pool of all registered voters. That's a switch from late August, when CNN last polled in Colorado and found a five point lead for McCain. That survey was taken as the Democrats' presidential nominating convention, held in Denver, was just getting under way. Colorado hasn't voted for the Democrats in a presidential election since 1992. But President Bush won the state by only five points over Sen. John Kerry in 2004 and the Democrats made major gains at the state level in the past two elections. That has led to hopes in the Obama campaign of turning the state - and its nine electoral votes - from red to blue. "The new poll indicates that Obama is winning Denver and the surrounding suburbs and losing everywhere else in the state," said CNN Polling Director Keating Holland. "Since our first Colorado poll was taken as the Democratic convention began in that city, it's possible that Obama is still capitalizing on a local convention bounce." Obama has also apparently won supporters in Pennsylvania, which has voted for the Democrats in the last four presidential elections. The new pollindicates Obama has a 9 point lead over McCain among likely voters, 53 percentto 44 percent, and a similar 9 point advantage among registered voters. That'sup from a 4 point advantage Obama held in the Keystone state in late August,the last time CNN polled there. Twenty-one electoral votes are up for grabs in Pennsylvania. places like Altoona and Erie." The poll also indicates Obama may be gaining a little ground in Michigan, which has 17 electoral votes. Among likely voters, Obama holds a 5 point lead, 51 percent to 46 percent, and a seven point lead among the larger sample of registered voters. Obama had a 4 point margin in the last CNN poll in Michigan, conducted at the beginning of September. Michigan has voted for the Democratic candidate in the last four presidential contests, but Kerry's victory over President Bush in 2004 was by only three points. The new poll also includes Montana, a state that President Bush won by 20 points in 2004. But the Obama campaign has spent time and money this year trying to turn the state from deep red to light blue. The new poll suggests they've made major gains from the 2004 results, but still have a ways to go. McCain holds an 11 point lead over Obama in Montana among likely voters, 54 percent to 43 percent. It's a similar story in West Virginia, a state that used to vote reliably for the Democrats. But President Bush won there by 13 points four years ago. McCain has a four point lead over Obama in that state, 50 percent to 46 percent. "Overall, the financial crisis may be boosting Obama's chances,'" Holland said. Our latest national poll shows that the public blames Republicans by a two-to-one margin for the financial crisis." Taking into account these new poll numbers, the CNN Electoral College Map estimates that if the presidential election were held today, Obama would capture 223 electoral votes and McCain would take 200, with 116 electoral votes still up for grabs. Two-hundred and seventy electoral votes are needed to win the White House. The CNN Electoral College Map is based on several factors, including polling, voting trends, campaign visits, and ad spending. "McCain may not be the incumbent president or vice president, but he represents the party in power. That's not a good place to be right now," says CNN Senior Political Analyst Bill Schneider. The CNN/Time Magazine/Opinion Research Corp. poll was conducted by telephone September 21-23. In Colorado, 932 registered voters and 794 likely voters were questioned. In Michigan 966 registered voters and 755 likely voters were polled. In Montana, 903 registered voters and 737 likely voters were questioned. In Pennsylvania, 920 registered voters and 730 likely voters were polled. And in West Virginia, 876 registered voters and 694 likely voters were polled. The survey's sampling error is plus or minus 3.5 percentage points for likely voters and 3 percentage points for registered voters. I live in Denver, and it's interesting the differences in enthusiasm between Obama supporters and McCain supporters. McCain supporters seem to at best say they're for McCain. Other McCain supporters seem almost reluctant and apologetic for supporting McCain. But the Obama supporters express their support much more enthusiastic. Enthusiasm plays a huge role in voter turn out. I think Obama will take Colorado. 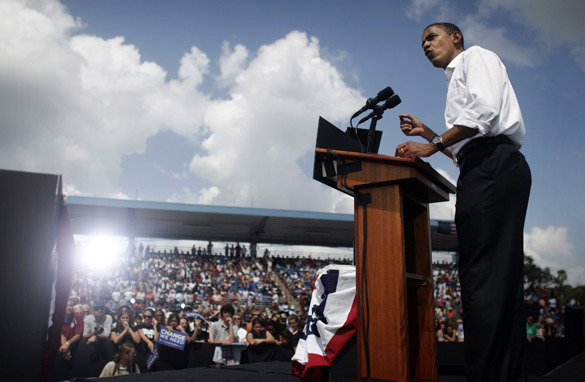 Obama's lead will grow even larger as people become more engaged and the election gets closer. McCain is running out of tricks...delayed convention, Palin surprise, cancel the first debate and the constant "what I really meant was....." People are beginning to see through McCain's "smoke and mirrors" or "shell game" The gig is up! McCain has just shown the world that he can lead and become instantly involved for his country,by suspending the campaign,unlike the just in it for me Obama. Fellow Clinton supporters: Please see the signals from Bill and Hill. DO NOT vote for Obama. We will win in 2012. Greg, screaming that you don't care doesn't make the truth go away. Obama will be the next president. Its not only that he's the better candidate now but McCain is showing that he's the more inferior. You should care what the polls say, they are telling you something. mccain you are a sick and disturbed man, nothing you do will change the ridiculous choice you made for vp, but this is a close second. Greg in Indiana you sound silly, I can't imagine how you rationalize Hillary being the most qualified and reconcile that McCain/Palin is a sufficent substitue. We need brains(democrats) in the White House this time. And you know it. We just spent the last eight years with a C student in charge. Open your eyes and see the light at the end of the tunnel..........it's Obama/Biden! I can't believe anyone with half a brain cell could believe that electing McBush/Palcheney would help this country in the slightest. rosa-get over it, move on. Vote for the issues that affect your life... Not just for the whoever wears lipstick!